Showbie offers many tools that you can use to utilize your classroom iPads to their maximum potential. Once you have created an assignment, students can submit their work to you via Showbie. You can also return it to your eager young minds complete with feedback. Your assignment is automatically available to students when they log into the Showbie app. When they tap it, they’re presented with the Shared Folder and any files that you’ve left for them. The proverbial ball is in their court. Let’s take a look at how they submit their work to you. Using an iPad in class opens all sorts of avenues for utilizing different media for custom expressions of knowledge. Students have access to a camera, microphone, and a host of creative apps. They can certainly submit a typed document for an assignment, but why not also utilize the wide and very rich range of options for submissions? Ask students to take or find images, maybe geometric shapes, illustrations of plants, anatomical diagrams, or historical maps. Then they can edit and add information to the images using Skitch, save the edited image to the Photo Library, and then submit it to a Showbie assignment. You’re thinking of having them create an engaging video or animation, but you’re scratching your head wondering how you’ll access all those movies. No problem. Students open the assignment in Showbie, tap to add a file from the Photo Library, and select the video for submission. Wondering how their reading skills are progressing? Want to give them opportunities to practice their new Spanish-speaking skills? Create an assignment that asks them to use the Voice Note and they can record themselves reading or speaking. 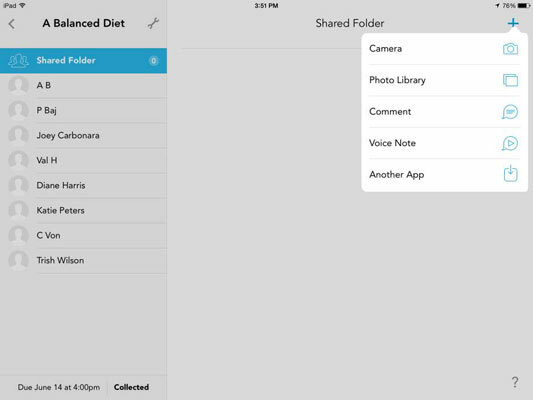 You can submit almost any content to a Showbie assignment using the iPad’s Share option. Most apps have a Share or Open In option. Simply tap the Share icon within the app that was used to create the content. Select Showbie as the destination app, and Showbie prompts you with a list of open assignments for submission. Easy. Oh, and you never used a single sheet of paper! Tap the assignment name to open it. Students who have submitted work have small attachment icons next to their names. Tap any student’s name to open that student’s folder. The submission is listed in the right side of the display, and you can simply tap it to open and review it. Note that if you upgrade to the paid version of Showbie, it includes tools for you to annotate the content. When you’re done reviewing the work, return to the student’s assignment folder and press the + icon on the top toolbar to leave your feedback. Once again, you can leave an assortment of file types, from a Text Note to a recorded Voice Note. As you respond to the submissions, a second tag appears next to the assignment name in the left column to indicate your responses.